Peter Calamai, CAP Foundation Board member, member of the Order of Canada, and recipient of the 2008 CAP-COMP Peter Kirkby Memorial Medal for Outstanding Service to Canadian Physics, passed away on Tuesday, January 22nd in his home in Stratford, Ontario. “We’ve really lost ‘one of the good ones’. He provided such wisdom and support in the promotion of physics and science in general – through his passion and his life, he will continue to inspire us all.”, said Dr. J. Michael Roney, Chair of the CAP Foundation. Peter Calamai was a Communications Consultant, Freelance Writer and Editor. He worked for more than four decades in Canadian daily newspapers, as a news correspondent for the Southam newspapers, as editorial page editor of The Ottawa Citizen, and as national science reporter for the Toronto Star. 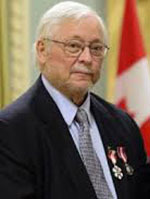 A founding director of both the Canadian Science Writers’ Association and the Science Media Centre of Canada, Calamai was a three times winner of the National Newspaper Award. He graduated from McMaster University in 1965 with a B.Sc. in Physics. An adjunct journalism professor at Carleton University since 2001, Calamai was also a Fellow of the Institute for Science, Society and Policy at the University of Ottawa. In 2014 he was appointed as a member of the Order of Canada for “his achievements as a science journalist and his contributions to the cause of literacy.” On June 11, 2015 Calamai received an honourary Doctor of Science degree from McMaster University.